We set out from San Diego harbor Oct 24th looking out onto an overcast, gray sky. But it was hard to focus on the gray skies when you had boat after beautiful sailboat racing through the waters. 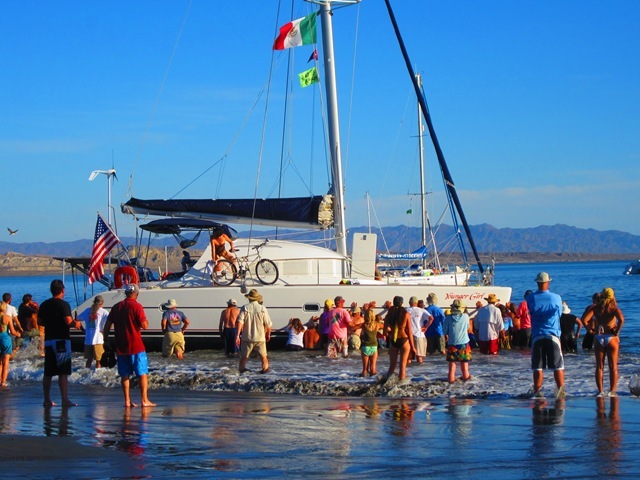 All the Baja Ha-Ha participants were waving and cheering each other on; everyone was so excited to finally be on our way. To earn extra “points,” the Camanoe crew donned our Team Zissou costumes that we wore the day before at the Costume/Ha-Ha kickoff party. Since it was a bit chilly, we were actually pretty grateful for the warm, red beanies that were a part of the costume. 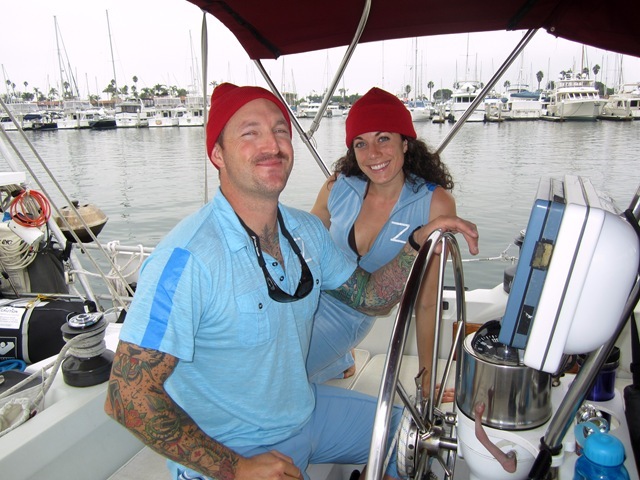 Nick and Michele…proud Team Zissou. The first leg started with a “rolling start.” Which means that everyone was allowed to motor because the winds were so light. Our motor doesn’t take us very fast, so when we hit the Coronado Islands, we realized we’d be going just as fast with the spinnaker up as we would sitting, listening to the droning engine. Thus, we ended up sailing, a good twelve hours or so before most of the other boats…which is supposed to give us a boost in our race time. Not that we’re really racing. Camanoe is like a turtle…slow and steady. We kept up for a while with most of the Ha-Ha fleet, but eventually we saw only a few masts on the horizon. No moon on our first night watch, but we could talk with the other fleet members on our radio. One of the boats had a problem with a line in their propeller about two hours into mine and Michele’s first night watch (so, probably around 1am or so). Although we were sad for them and wished we could have offered them some helpful advice, we couldn’t help but feel better that we weren’t alone in the back of the pack. Dave radioed to offer assistance, but there were already other Ha-Ha boats in route to help. That was the best part about being on the Ha-Ha; knowing that so many others are around to help you should you need it. 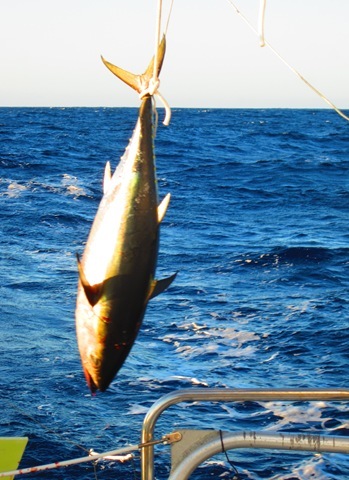 We caught a 20-25 lb Yellowfin tuna on the second day of the first leg. It didn’t put up much of a fight, in fact, we thought we might have just caught some kelp. We had a heck of a time filleting the sucker up on the slippery and rolling back deck, but the boys were eventually successful at getting us enough fish for two good-sized dinners. We thanked the ocean and fish gods and sent the remains back overboard to feed the bigger fishies. Day three of the first leg was more of the same. 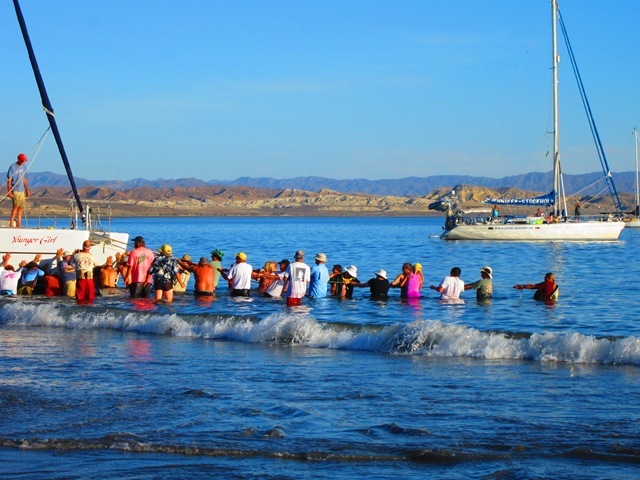 I was seasick the first day, but not the second and then felt pretty queasy the morning of the third day. Odd. I think I was dehydrated. So I tried to rest and not do much on the third day. Luckily, our crew were absolute rockstars and pitched in to help cook and clean up, etc. We passed the finish line of leg one on Thursday, Oct 27th in late afternoon, but we still had a ways to go before we got into the Turtle Bay anchorage. With all crew on deck (looking out for lobster pots and kelp patches), we pulled into Bahia de Tortugas just as the sun slipped below the horizon and dropped our anchor. So happy to be semi-steady in the boat, we cooked up some good eats and were out like lightbulbs by 9pm. The Turtle Bay Ha-Ha bbq and potluck was the next afternoon. We took pongas ashore for a couple of bucks each so we wouldn’t have to put our dinghy into the water just to have to hoist it back up the next morning. Dave realized as we were leaving that our batteries were low, which was odd because we ran our generator to top off the batteries a couple times a day during the leg (because we weren’t running the engine). So Dave headed back to the boat to check it out further while the rest of us did some sunbathing, frisbee throwing and tug-o-warring with the rest of the fleet (another tug-o-war win for the women!!). Good times all around that afternoon, except for one catamaran that pulled A LITTLE too close to the shore and got stuck (it WAS low tide, but still, no reason to get that close). Lots of people tried to push and pull them back into deeper water, but in the end, all they could do was wait for higher tide. Made for a pretty memorable end to leg one though!